Because, elsewhere in his news conference, this is what is really at work, Bach explaining how the world has changed in detailing the troubling dynamic that is driving the 2024/2028 move. Things have changed, and fast, driven in large measure by the amplifying power of social media to leverage a referendum to threaten, if not actually take out, a project. That's what happened to the Budapest 2024 bid, which went down earlier this year in just six weeks — even though it had lined up exactly that sort of wide-ranging support. For those so inclined, I was ahead of the curve again here as well, anticipating in a column in March the remarks the president made at his Friday news conference. Bach said, “The world, in some — many — western countries, particularly in Europe, has changed dramatically. Of course the IOC has only itself to blame for this predicament. Why? Because it is perceived as the establishment. Why? Because over the past 25 years it has franchised out government-run Games that have been used as catalyst for massive infrastructure projects. These projects have rung up huge bills: Beijing 2008 ($40 billion), London 2012 ($15 billion), Sochi 2014 ($51 billion). The Rio 2016 bill is due next week. Tokyo 2020 is already twice the bid-book estimate, at $13 billion. This is why, to use Bach’s phraseology, the world, particularly in Europe, has changed “dramatically.” Taxpayers are saying, and emphatically, enough. Nine European cities have dropped out for 2022, 2024 and 2026. “This change in the attitude, we could complain about it but we should not ignore it and we should even less ignore it because … we are giving some arguments for this skepticism. What the executive board did Friday, acting on the recommendation of its four vice presidents, is pass along the 2024/2028 proposal to the full IOC membership. They will take it up at an “extraordinary” IOC assembly called for July 11-12 in Lausanne. 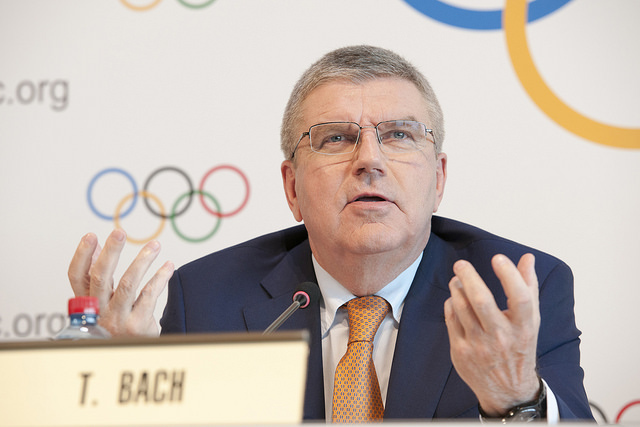 Most likely, because Bach has signaled this is what he wants and the IOC president traditionally gets what he wants: the 95 or so members will ratify the proposal, and at a follow-on assembly Sept. 13 in Lima, Peru, things will be finalized. The plan, Bach said, is for the members to give the 2024/2028 plan the OK in July and for the IOC to commence real negotiations with the two cities thereafter with the aim of producing a “win-win-win” — for both cities and for the IOC as well. Of course, the IOC being the IOC, things could get done whenever. Never say never to anything. The obvious issue is who gets 2024 and who gets 2028. Last September, I suggested LA 24, Paris 28. The last week has seen a big push in a variety of outlets for Paris 24 followed by LA 28. Bach’s would-be reform plan, dubbed Agenda 2020, needs evidence to be made real. Bach was elected in 2013. At best, given IOC term limits, he gets until 2025. That means 2024 would be the only Summer Games for him to implement Agenda 2020, his personal legacy. As Bach himself has made plain, the world has changed. As the executive board underscored Friday, what the IOC needs is time and stability. By extension, what the IOC needs, and particularly for 2024, is seven years of peace. In the aftermath of Sochi and Rio in particular, this could not be any more obvious: seven years of peace. The disconnect is the equally obvious attempt to make it seem as if the Paris and LA bids are more or less the same — that is, an IOC risk management that makes it seem Paris and LA are apples to apples. For the historical record: they are apples and oranges. This is manipulation approaching the same order that eight years saw Rio de Janeiro’s technical merit boosted into the same league as, say, Chicago’s, and enabled the members to vote with good conscience for Brazil for 2016. This is why the IOC is in such deep trouble with taxpayers in western Europe. Because it can't, or won’t, tell the truth about the truth. LA 2024 envisions no permanent-venue construction. Zero dollars. Moreover, it is not a government project but a privately run entity, just like 1984. Look, if you're the Americans, there assuredly could be a negotiating upside to 2028. All kinds of upside. The point to be made, though, is not about what might be best for Los Angeles, or California, or the U.S. Olympic Committee. It's about what's best for the Olympic movement. For sure Paris can boast, as it does, that 95 percent of its plan exists. It’s the 5 percent that needs to be built that is the killer: an athletes’ village, a swim complex and media housing at a proposed cost of $2 billion. History has shown that such estimates are laughably low. In Paris for 2024, the IOC buys more of the same: that is, more of the construction, political, environmental and other dramas that have spelled bad headlines elsewhere in the world. Again, it is these headlines that have left the IOC reeling and created the credibility gap that has left taxpayers so disconnected and so alienated government officials. The security situation. To pretend otherwise is to be naive. The entire country has been under a long-running state of emergency. An Olympics is supposed to be a celebration. How is that supposed to happen? The lingering prospect of referendum. See Denver 1976. The risk is not the same in LA because, again, it’s not a government project. Little noticed in the press but well-noted within the IOC is the ongoing — and potentially explosive — inquiry by French authorities centering on the former track and field federation president Lamine Diack. The IOC, because it is “partie civile” to the case, knows the outlines, if not more, of what’s what. This helps explains the urgency of why the IOC would be so keen to get the two cities to strike a deal. It’s not just that it avoids the label of one city or the other being labeled a “loser.” Follow the logic. If there’s a deal, and then the Diack-sparked case breaks wide open, the IOC can say, hey, don’t go pointing fingers at Paris 2024 or blaming us if the French law enforcement authorities expose this or that — everybody agreed to this deal. The next few weeks and months are likely to produce moments of keen emotion. Politics, especially Olympic politics, is rooted in emotion. If 20 years of covering Olympic politics has proven anything, it’s that all kinds of emotion attaches to anything involving the United States. All the more so now. This, though, is a time for the IOC, and its members, to think — and act — strategically. This is a time for the IOC to get it right.